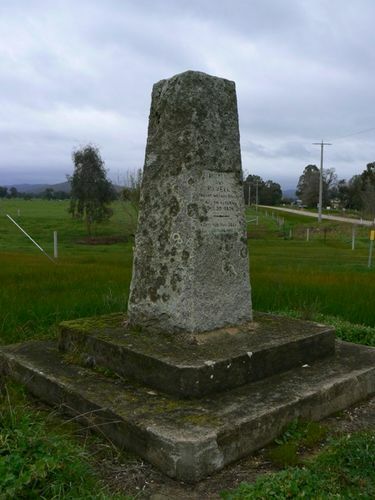 Monument erected to commemorate the Hume & Hovell expedition passing near the area in 1824. During the Hume and Hovell Centenary celebrations a section of the representatives of the Historical Society and the Royal Automobile Club of Victoria will stay overnight at Benalla, arriving on Wednesday evening, 19th November, on the completion of their tour through Angleside, Moyhu; etc. The following is the itinerary of time-table for the unveiling ceremonies. Every endeavour will be made to observe the times specified, and local secretaries have been asked by Mr. W. F. Gates, hon. secretary, to have their arrangements complete at the times specified. The party will leave Melbourne on Saturday. 15th November, and proceed to Mt. Buffalo. Unveiling memorials will proceed along the route, and on Thursday, 20th November, the first party leaves Wangaratta for Benalla. The programme will then be: — . Thursday, Nov 20. — Unveiling cairn at Warrenbayne 11.30 p.m.: do., at Violet Town 12.30 p.m.; do. Euroa at 2.30 p.m.; do., Avenel at 3.30 p.m. Wednesday, Nov. 19. — Second party leaves Albury for Wangaratta (lunch). Unveiling ceremony at Moyhu, 2.30 p.m.: unveiling at Hansonville. 3.30 p.m.; unveiling at Molyullah, 4.30 p.m.; arrives at Benalla. stays night. Thursday. Nov. 20.- — Leaves Benalla (party divides) ; first division unveils cairn at Tatong 10.30 a.m., and division unveils cairn at Samaria, 10.30 a.m. and Swanpool 11.30 p.m.; united party lunch at Doon 1 .45 p.m.; unveil cairn at Woodfield. 3 p.m., and Yarck 4.30 p.m. Stays night at Yea. On the following day unveilings will take place at Yea, Strath Creek and Broadford. On Saturday, December 6th a memorial at Upper Plenty will be unveiled, and a district excursion from Wallan to Mt. Disappointment will take place. A further series of unveilings will take place in the shires of Kilmore, Broadmeadows, Bulla, Keilor, Braybrook, Werribee and Corio in December. Benalla Standard (Vic), 11 November 1924.